You'll need video player software to watch the news clips. Whatever you do after you drink, don't drive. Hey Mom, Dad, teachers: These videos may be a little more effective than lecturing the discrimination victims about how they should have respect for the law, when hypocrites impose the law upon them in violation of their rights, against their will, as a consequence of overt bribery by Congress. Some people under 21 think rights are more important than roads. Its not your fault that youre under 21 and its not your fault the state legislature just laughs when libertarians demand liberty and justice for all. Its not your fault other people were under 21 when they misused cars by driving them drunk. 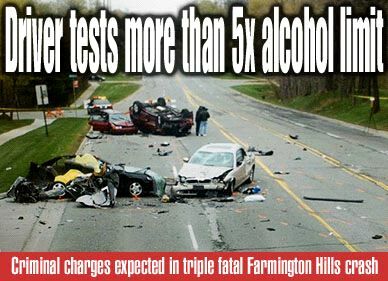 However, if you misuse a vehicle by driving it after drinking, that is your fault. Dont let the states prosecution of alcohol suppliers mislead you into thinking its the suppliers fault. Dont even think of trying to save a taxi fare by playing blotto lotto. 18 March 2005, repeat offender kills her own kid in crash. Video. 1 April 2006 Driver, 34, kills children, 8 and 9, others. 6 May 2006 Driver, 21 kills himself and girlfriend, 16. 6 May 2006 Driver, 16, kills passenger, 17. Teenager killed in non-drinking, drag race crash. 28 October 2005 Driver, 15, (not drunk) kills girlfriend, 17. Got money? Can you get a grant? Find episodes like this and like http://www.wftv.com/news/4368714/detail.html?rss=orlc&psp=news and piece them together, one after another. Get permissions from the TV stations. Publish the video so it can be a useful tool to deter people from misusing cars by driving them drunk. Add only the date, station call letters, its channel number and its location.